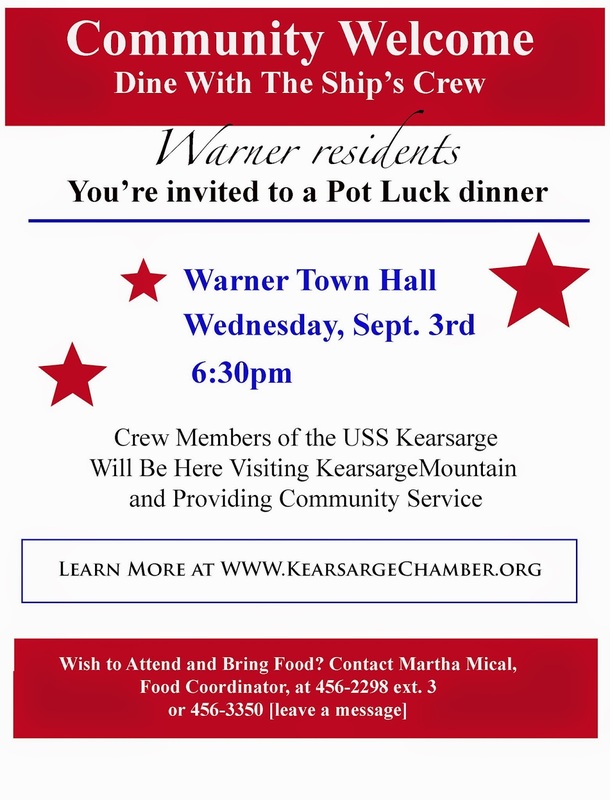 Warner residents are invited to a community pot luck dinner at the town hall on Wednesday, September 3. This gathering is to welcome approximately 20 crew members from the USS Kearsarge. This is a Wasp-class amphibious assault ship of the U. S. Navy, which hauls cargo, vehicles, and serves as a launch site for helicopters and fighter jets. In its non-combatant role, it provides humanitarian missions around the world. The ship is over 800 feet long and carries more than 2,000 personnel. During their two-day visit, crew members will renew the tradition of climbing the mountain of their ship’s namesake and provide community service. Residents will have an opportunity to meet the crew at 6 p.m. on September 3, and enjoy dinner with them at 6:30. A program about the mountain and life on the ship will conclude the evening’s festivities. Martha Mical is food coordinator for the dinner, and those wishing to attend are asked to tell her what they will bring. She can be reached at 456-2298, extension 3, or 456-3350. If she does not answer, callers should leave a message with their telephone number.